The days of hemp and chia seeds dominating every vegan-friendly menu are thankfully long gone. Now there’s doughnuts. Pizzas. Chicken wings. And of course, the humble burger. Until recently, burger joints in the capital could get away with murder when it came to non-meat options. Think giant mushrooms slathered in ketchup. Microwaved and mushy bean burgers. But with more than half a million people in the UK now identifying as vegan, sloppy mushroom patties just don’t cut the mustard anymore. 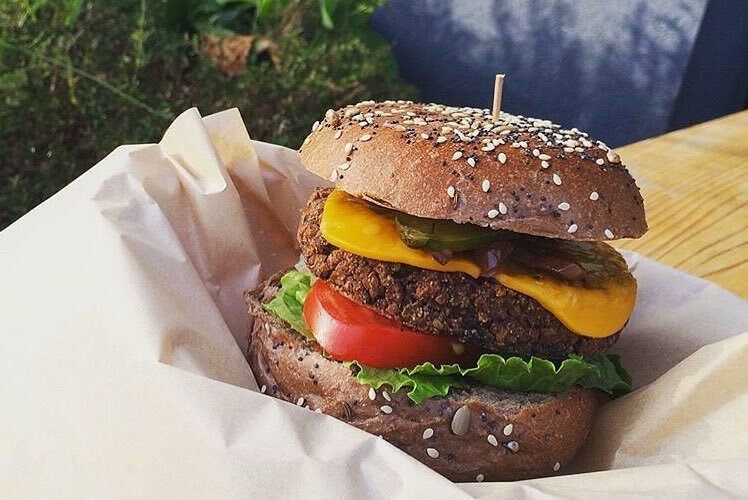 So whether you’re a lifelong vegan, a new-joiner because of Veganuary or just dipping your toe into the vegan lifestyle, these are the best vegan burgers you can get in London with City Pantry. We know what you’re thinking. With beef burgers, lamb burgers and even a burger packed with buttermilk fried chicken adorning their menu, Patty & Bun is the sort of place you’d go if you’re a die-hard carnivore. Until now, that is - because they’ve only gone and introduced a vegan option. And you know what? It’s pretty damn delicious. 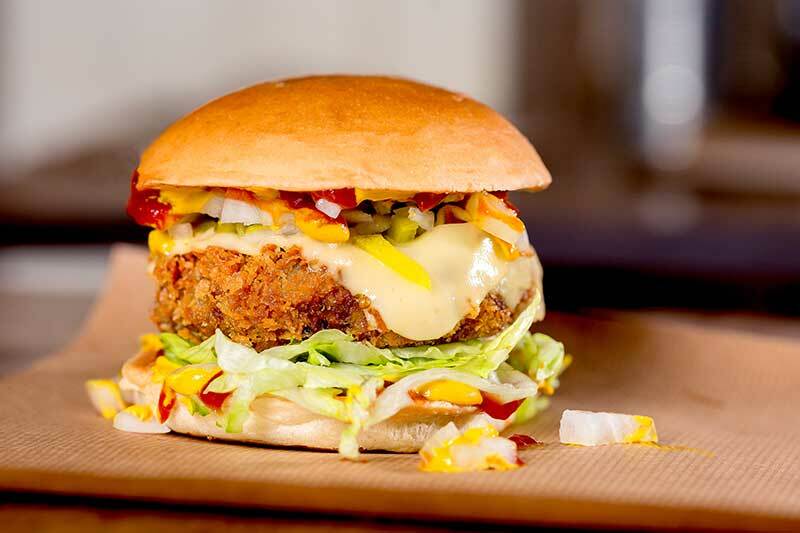 With a tempeh and mushroom fritter topped with pickled cucumbers, diced onion, double smoked gouda (vegan) cheese, mustard and ketchup all packed in between a tasty Bonsoy bun, be warned: The Whoopi Goldburger is about to become your new favourite burger. Full stop. Glossy, creative and a little bit picture-perfect. Vegan fast food that doesn’t compromise on flavour, NYC-export By CHLOE are one of the biggest vegan names in the capital with a menu consisting of pastas, salads, fish ‘n’ chips and of course, burgers. And the best vegan burger at By CHLOE? It has to be The Guac Burger. Made from a mixture of black beans, quinoa and sweet potato that manages to not only taste delicious, but have a real density and texture that’s sometimes lacking with vegan burgers. The toppings include crisp tortilla sticks, corn salsa, a spicy chipotle aioli, and a mound of creamy guacamole that’ll have you coming back for more. Again and again and again. The best part? You can get this delicious meat-free morsel delivered directly with City Pantry. 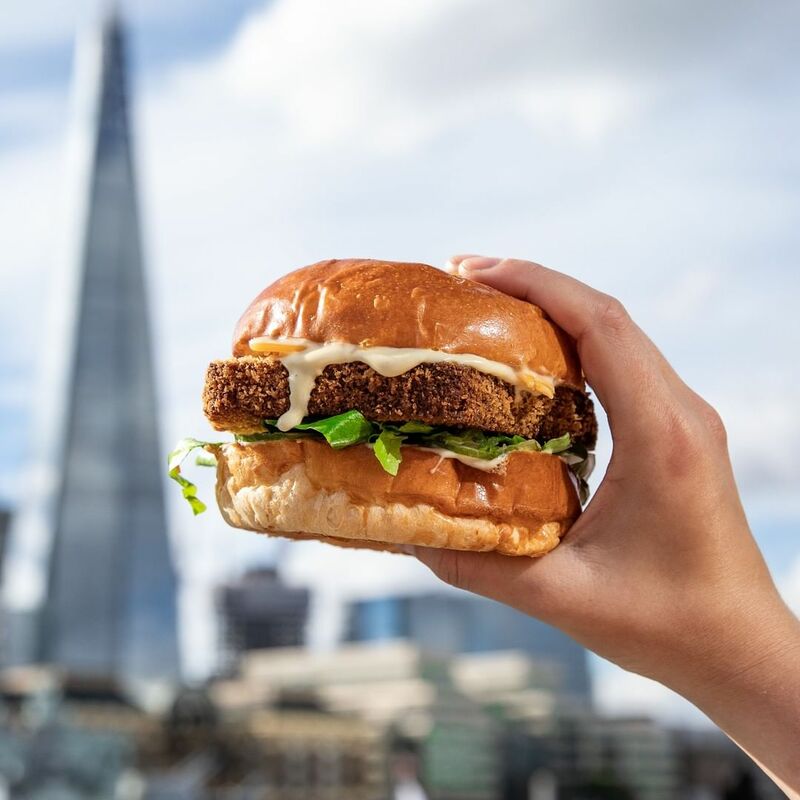 Ever since Twisted launched their delivery-only restaurant in the capital and started bringing their incredible video creations to life, they’ve been a go-to for many a hungry Londoner. And especially hungry vegans. That’s because Twisted London have a whole range of vegan fast-food on their menu. We’re talking Dirty Vegan Fries. Vegan Chicken Wings. And of course, incredible vegan burgers with their KFV and Hot Vegan burgers. So if you’re new to Twisted London, start with the KFV. Thanks to soft and tasty panko crumbed vegan seitan ‘chicken’, vegan cheese, avocado and a healthy dollop of chilli jam, one taste of this vegan burger will never be enough. Trust us. Best order a couple just in case. London is a bastion of culture, arts, literature, history and really good chicken shops. Chicken shops like Absurd Bird, whose buffalo wings have reached legendary status over recent years. But what’s also on the rise on their menu is their downright delicious vegan burger. 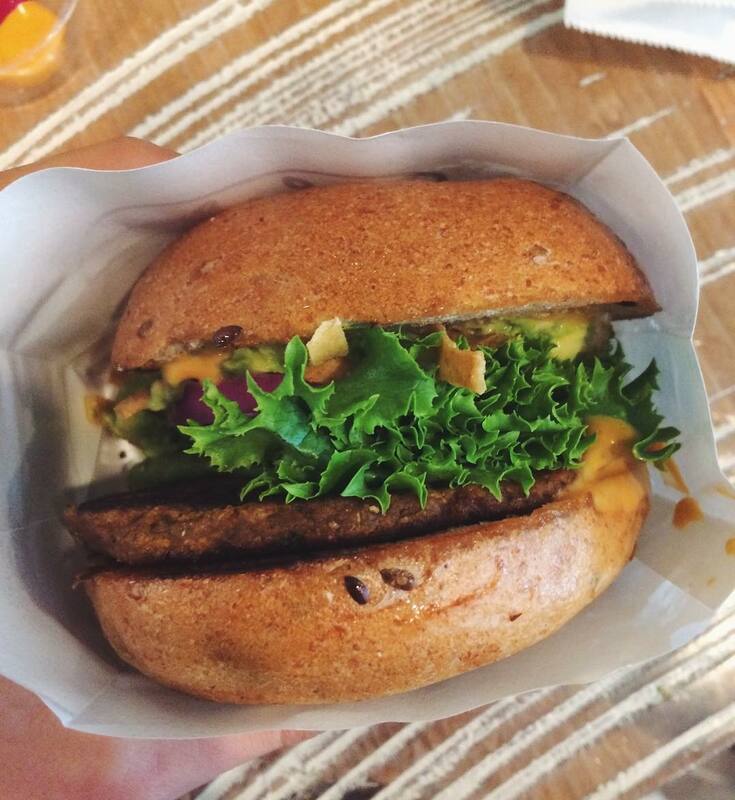 And the first thing you need to know about Absurd Bird’s Black Bean & Sweet Potato burger is its size. It’s massive. So massive in fact, that a few bites is more than enough to satisfy your burger cravings. And with a specially-created black bean and sweet potato patty complete with caramelised red onions and plenty of spicy sririacha, this definitely isn't your usual two-bit, fast food chain cop-out. The perfect cheat-day treat, get it straight to your desk next lunchtime with City Pantry. Translating to “chopped” in French, Hache are all about serving up the most incredible gourmet burgers for die-hard carnivores to sink their teeth into. Well, they were. Times are changing and so are Hache. So with that in mind, say hello to their Secret Garden, a not-so-secret burger that’s sure to get the taste buds tingling for vegans and non-vegans alike. 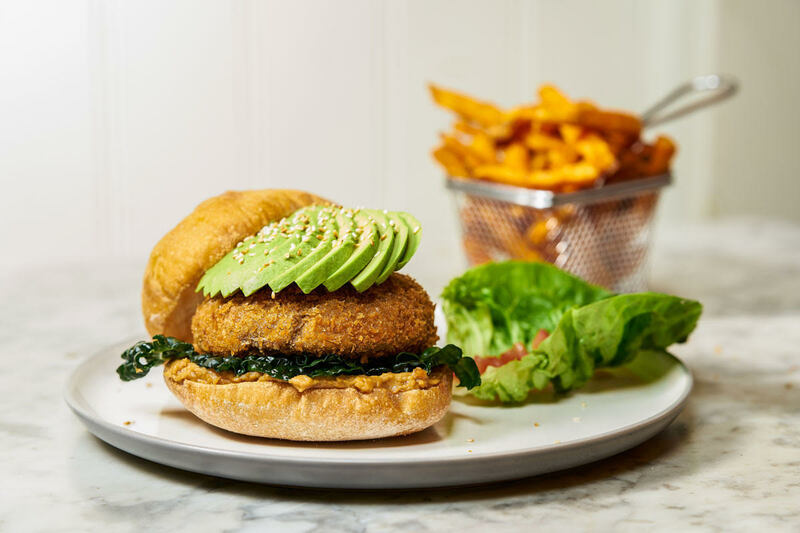 Using only the freshest ingredients, the Secret Garden Burger features a Portobello mushroom coated in Panko breadcrumbs with a hint of sesame seeds, served with spicy peanut sauce and crispy kale, topped with a fan of avocado on a toasted Ciabatta bun. This top-notch burger is limited edition so if we were you, we’d get it while it’s hot. 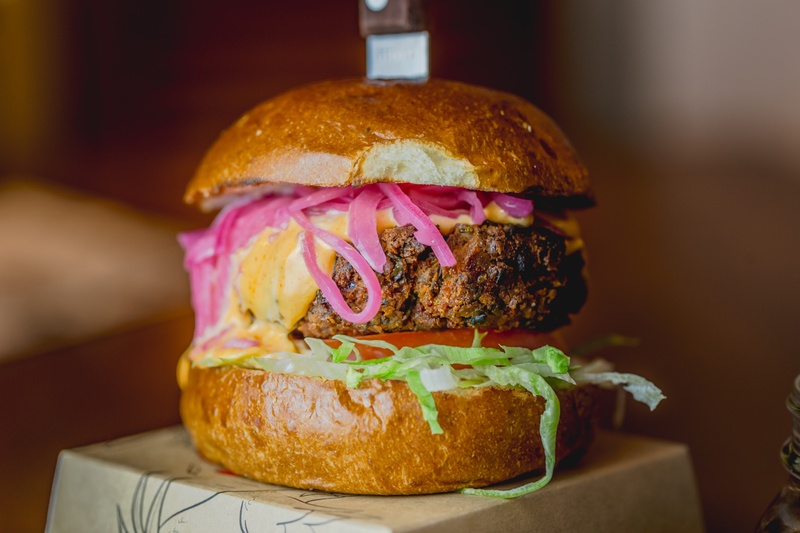 You might not expect a Scottish game-focused restaurant to serve up one of the best vegan burgers in London, but it’s safe to say Mac & Wild’s Bloody Roots Burger is a bit of game changer itself. 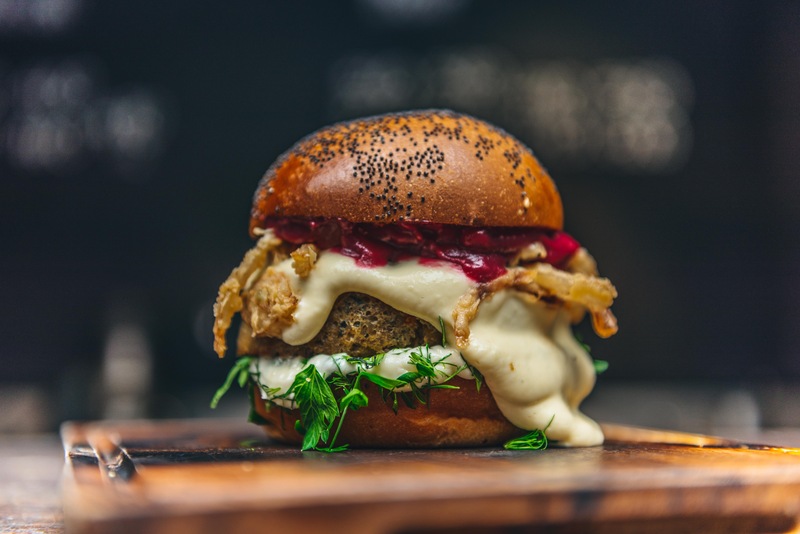 Featuring a Macsween veggie haggis patty and flavoursome beetroot ketchup, joined in holy matrimony by gooey vegan fondue and plenty of soyannaise, this is a burger that tastes just as good as it looks. And boy does it look good. Serving up wholesome plant-based food that doesn't cost the earth, Mother is one of the best vegan-only eateries in London. And they’ve got a burger so good it’ll make Meat-Free Mondays become your everyday. Comfort food at its best, The Big Momma Burger is a juicy bean patty smothered in burger sauce and cashew cheese that you’ll never believe is actually vegan. But it is. So if you’ve got a craving for a vegan Big Mac, Mother has got your back.